Creating a benchmark: part 6 problem solved! Quite some time ago, in fact more than a year ago now, I was working on a basic series of benchmarks to test the comparative performance of the Borland Graphics Interface (BGI) versus a hand coded graphics library. I ran into a problem with my hand coded library not working on some of my real hardware. I ran the tests on a Pentium MMX @ 200Mhz and a 386sx @ 20mhz, it ran fine on the newer machine whilst failing on the older one. I figured perhaps I was overloading the older graphics chip. So coming back to the problem today with a renewed sense of determination, I did some reading. There happened to be a book in the university library about programming VGA graphics, and I noted that all of their code only copies single bytes to graphic memory at a time, I was copying 2 bytes (a 16 bit word) at a time so wondered if that might be the issue. I changed it and the program still crashed almost immediately. After some tinkering and some basic math I worked out that sprites being drawn near to the bottom of the screen were the cause of the problem. The test algorithm actually allows sprites to be drawn partially obscured by the right or bottom edge of the screen. On most VGA cards this isn’t a problem, but the trident chip in the 386sx didn’t like any pixels being drawn outside of the visible frame buffer. After writing some basic clipping into the sprite routines the program worked all the way through. I’ve tested 3 different programs on two different real machines (as opposed to emulation). BGIbench is the original program that uses the provided graphics libraries that came with Turbo Pascal, I’ve used it in conjunction with the VGA256 BGI driver. VGABench is the initial lazy implementation of a hand made graphics library, it’s implemented entirely in pascal and isn’t optimised at all. Lastly is VGABench2 which is an optimised version of VGABench using assembly where necessary, and in the case of line drawing a better algorithm. All three programs were coded and compiled with Turbo Pascal 6.0 and use the same basic test code. Each program performs 7 tests based around primitive functions found in the BGI. Each test counts the number of primitives that can be drawn over a period of 30 seconds. VGABench doesn’t have a function for drawing circles so it has no results for that test. The tests in order: put-pixels simply draws individual pixels a random colour. Filled Boxes draws solid coloured rectangles in a pre-defined pattern. Circles draws a number of concentric circles in a per-determined way. Random lines does what you’d expect, drawing lines randomly. Horizontal and vertical lines are similarly obvious. 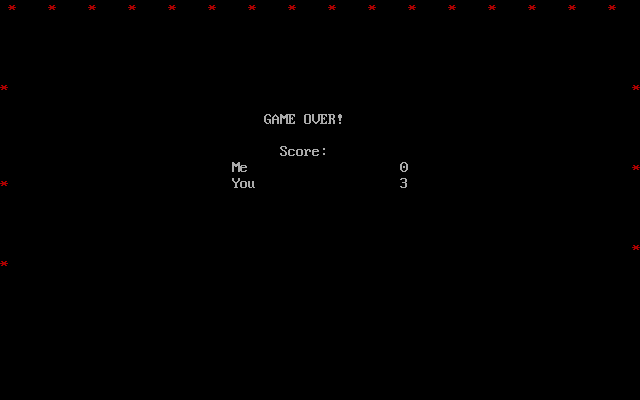 Finally the sprite test draws a 10×10 bitmap at random locations on the screen. At first glance it’s pretty obvious that optimised, hand written code is significantly faster on the Pentium, particularly for filled boxes and sprites where VGABench2 achieves roughly twice the output to the screen. I managed a five-fold increase in the rate of drawing circles, which is impressive as circles are the hardest to draw. 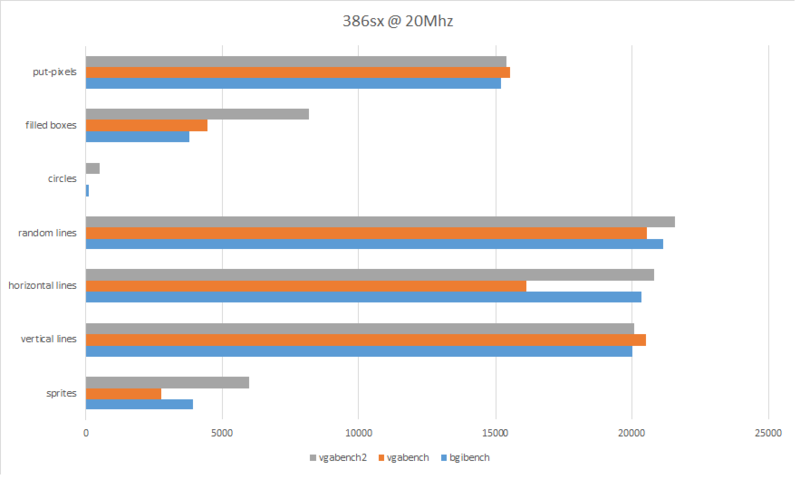 The first VGA Bench however is not really much better than the BGI and in some tests actually performs worse. You’ll note that the put-pixel tests all come out fairly close in terms of results, this is because there is little to optimise there. I suspected that the reason VGABench2 performed so well is because the code copies 16 bits at a time instead of 8bits. I tested this out by changing it to copy 8bits at a time and found it was still faster than the BGI, but by a much smaller margin. VGABench2 copying 16bits yields about 156k sprites, but modifying it to copy 8bits yielded about 80k compared to BGI which achieves around 73k sprites. The first VGABench demonstrates how important optimisation is. It copies data 16bits at a time, but doesn’t even achieve the performance that BGI does, managing around 68k sprites. The picture looks quite different on the 386sx machine, with the performance looking much more even with a few exceptions. The BGI seems to perform comparatively well across most categories only lagging behind in drawing circles, filled boxes and sprites. My first lazy implementation, VGABench seems to lag behind in pretty much everything except drawing filled boxes, which barely outperforms the BGI. 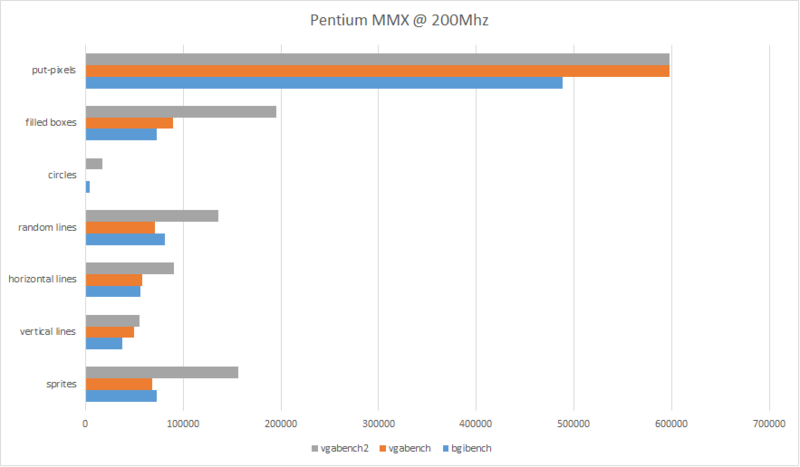 The results for VGABench2 are good, but not as good as on the Pentium machine. Line drawing is basically the same speed as the BGI. Filled boxes achieves about twice the speed, and circles about 5 times the speed, but the sprites are comparatively slower at about 1.5 times the speed. The explanation for the performance of sprites and filled boxes is interesting and is related to how the test is implemented. The filled boxes are drawn in a deterministic way, a grid of 10×10 sized boxes, the sprites are distributed randomly. Filled boxes end up being drawn pretty much always on even addresses, and sprites will be drawn on even and odd addresses around the same amount. This affects speed because of something called word alignment. The 386sx, 286 and 8086 processors have a 16 bit data bus, which means the processor can access 16bits at a time. The memory is organised as a bunch of 16bit words, so when accessing 16 bits on an even address only a single memory word is accessed, and when a 16 bit access needs an odd address, two memory words are required. This means doing 16bit reads/writes on odd addresses are half as fast as on even ones, in fact they are about the same speed as an 8 bit transfer. In beginning to sum up the series, it’s important to remember why I started it at all. Basically I remembered hearing many people discouraging use of the BGI mostly because it is slow compared to hand crafted code. The tests I’ve done have confirmed this, but I feel that it’s also shown how a lazy (or poor) implementation can be even slower. My optimised code is faster, but took a lot of time and effort to create and is missing many features that the BGI provides, such as support for other graphics cards, clipping, and other graphics primitives that are more complicated. I can see why many people without the time and know-how would have found it easier to simply use the graphics library provided. That being said, hand written optimised code certainly has an important place as well. It was pretty fun and challenging to try and make something faster, even though I almost certainly didn’t get my code anywhere near as fast as more proficient assembly programmers. Also it’s hand optimised code that made many PC action games possible at all. Gaming on the PC would be very different without the hardware guru’s that could squeeze amazing things out of basic hardware. Writing this has made me reconsider my stance on sticking with the BGI for my platform game, I probably won’t gain a lot of performance, but I may be able to get it to work on older hardware as a consequence. Code and binaries are available from the pascal downloads. Before the Christmas break I started writing a encoding/compression library based on a technique called Huffman coding. I’ve since completed and tested the encoder and decoder, today we’ll discuss the results of several compression tests in comparison to the RLE encoding technique. Here are links back to the posts for Huffman Coding and Run-Length Encoding. So I’ve collected a few different types of data files with different characteristics. First up is a MS-DOS executable, these binary data files typically don’t contain runs of data and will tend to contain most if not all symbols. Next is a ASCII text file, which will typically only use alphabetic, numeric and punctuation characters. Lastly a small number of graphics files, in raw bitmap form, these particular images are fairly basic (only a handful of colours). Here’s a table showing the results. You’ll note that the Huffman encoder achieves better results in every example! The worst result for it being the MS-DOS executable, which is of course expected. I was pleasantly surprised that the small graphic files compressed quite well, this is likely because of how few symbols are in these files. If there had been a large variety of symbols the dictionary and the encoded data would be much larger. Run-length encoding was obviously much worse, and in the case of ASCII text and executable data it actually increased the size of the data! Knowing how it works this is hardly surprising. I did expect RLE to perform better than Huffman coding for the graphic data, but I suspect the low colour count in these files is an influencing factor. So I thought I’d create a graphic data file that had a higher colour count that would favour RLE to see if it can do better under specific conditions. The graphic data I created is a sprite 32×32 pixels with horizontal coloured stripes, each a unique colour. The size of the raw file came out at 1026 bytes. The Huffman encoder produced a file of 766 bytes and the RLE produced one of 68 bytes! Whilst the Huffman encoder still managed to compress the data, it couldn’t match the best case scenario for RLE. There are good reasons to use both compression techniques. Run-length encoding doesn’t require much CPU power to encode or decode, so it can be done on very weak machines (even old 8-bit machines), but it only compresses data with many runs in it well. This turns out to be useful for graphics and level data. Huffman coding will pretty much always reduce the size of the data encoded, sometimes significantly, but it is much more complex. It requires more RAM and CPU power to achieve this result, so it can’t be used on every machine, although most modern processors would have no trouble at all. I’ve made the code for the Huffman encoder/decoder available in pascal for download. be aware the encoder still has some debug code in it that will write to the screen. 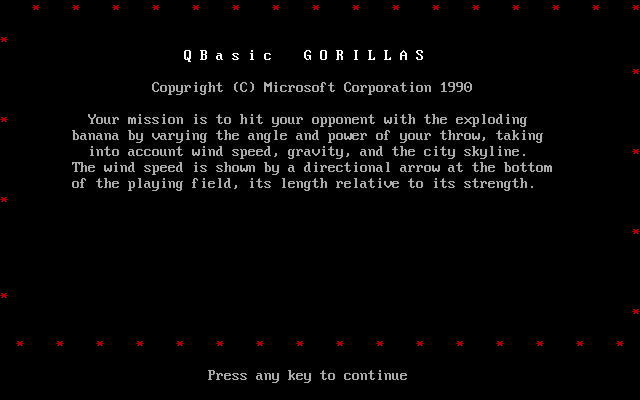 Today I’m looking at the classic old artillery game Gorillas, it was an example program for the Qbasic interpreter that was packaged with MS-DOS 5.0 and later. Because it was so widespread, being on practically every machine of its time, it was widely played and loved by many. I first encountered it on our high school computers in computer studies classes, we often got to play some games after we finished our work. We played many games, but Gorillas (and Nibbles) were favourites. Being written in Qbasic graphics and sound support is fairly basic. Unless you’re using an old machine with CGA only, the graphics are in high resolution EGA (640x350x16) and whilst not spectacular have some charm. Sound is PC speaker, again largely due to the limits of Qbasic. Most sounds are fairly basic, although the intro tune is kinda cool. The game field consists of a city skyline with two Gorillas atop a building at opposite ends of the screen. Each Gorilla takes turns hurling an explosive banana at the other, with the player aiming the shots by entering the angle and velocity. The round only ends when one of the Gorillas is hit by a banana, with the survivor being the winner. There was no computer AI, so you had to play it in a hot-seat style or on your own. It’s simple and fun to play, although there isn’t much variety. Normally this is where a post like this would end, with some kind of summary of what I thought. Today however I decided to have a quick go at making a simple modification to the game, adding an AI to the game so you can play solo. The tricky part with making an AI player in this case isn’t making something that will play well, but making something a human has a chance of beating. I could quite easily make it simply calculate the ideal velocity and angle, but that wouldn’t be much fun. So what have I done instead? It’s a fairly simple algorithm, I set the initial aim to some sensible defaults and after each shot adjust the velocity depending on whether the shot landed short or long. This actually proved to be quite good at making hits, but not before making a few shots giving a human player a chance. Occasionally they will make a hit on the first shot, but that only happens when the buildings are set up just right. One circumstance that the computer does poorly is when a tall building is blocking the path of the bananas. I deal with this to a degree by making the angle higher when the banana doesn’t go very far. It will still take many shots for the AI to succeed. I’ve made the modified version available here. 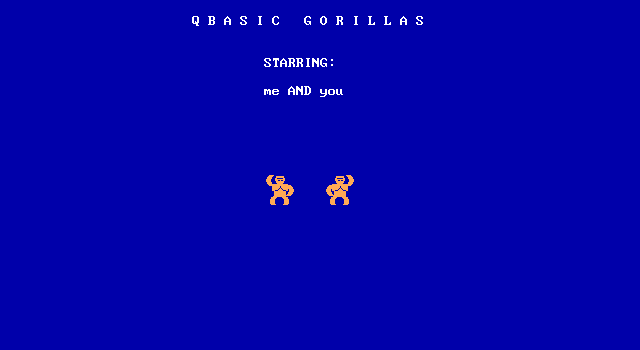 It requires the original Qbasic to run and DOS in one form or another (Dosbox recommended). The game is pretty much unchanged apart from adding the AI, which you activate by naming a player Computer. You can have the computer play itself by naming both players Computer. 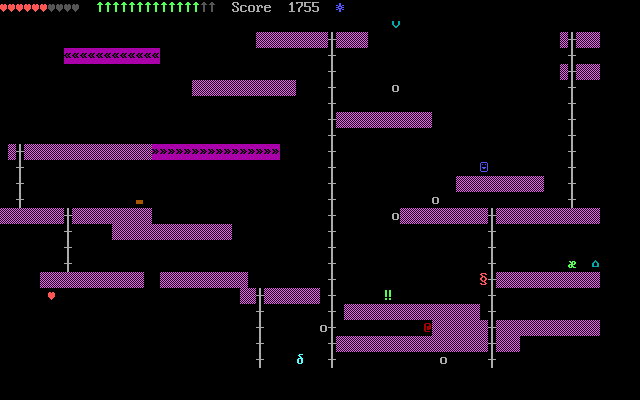 Another improved version of the game exists, and has improvements such as a league table and improved graphics and sound. It’s called Gorillas Deluxe and can be found here.